Communication flow is the cornerstone to a well-oiled healthcare organization, from patients to providers and internally across departments or locations. New technologies in communications have reduced errors, improved privacy standards and increased bottom-line revenue for healthcare organizations. So why in 2017 would a healthcare organization opt to still use traditional legacy faxing systems? Is your company still sending old-school paper faxes? If so, it's time for an update. There are so many myths that surround communication systems. Not only are communication updates easier than many people assume, they also minimize error and improve efficiency in the workplace. If you are still using old-school faxes, this paper dinosaur is on its way to becoming extinct. With a need for space, who has room for a clunky fax machine anyway? Turns out, not very many organizations. Traditional faxes are inefficient. Many come in with pages missing or are unreadable. If they do come in intact, they need to be organized and then prepared to be filed. You have to keep checking the machine to determine when a fax arrives...and often it (still) hasn’t come through. These conditions reduce privacy, expose data to loss and make paper faxing a huge time-waster. Did you know that fax machines are subject to hacking as well? It is a myth that they are not. The other major consideration is that many healthcare organizations, agencies, and programs like Medicare and Medicaid like are moving their records to the cloud in the near future. If you have not already embraced the digital age with your records and are anticipating upcoming deadlines, consider transferring them preemptively. A centralized resource streamlines file access. More healthcare organizations should be analyzing their faxing protocols and processes, as they often are in different areas. Data can provide a guidepost that helps executives better understand where all of that time is going, and how to fix any problems with workflow, workload or employees. Cloud faxing allows for the generation of reporting so you can track progress and process to streamline over time. E-faxing is an easy to set up system to solve your legacy faxing issues we covered above. A few major reasons your healthcare organization can benefit from this new style of faxing. Improved privacy and HIPAA security. Patient security and privacy is by far the most important aspect of communication efficiency and liability for healthcare organizations today. E-faxing considers the variables that risk privacy and altogether reduces this issue by complying with all HIPAA standards and rules. Overall efficiency for staff communication. E-faxing software offers the ability to send communication through different types of devices, communicate before and after hours, and throughout a healthcare organization and so on. Staff is also able to help facilitate patient appointments, labs, x-rays and procedures more efficiently by being able to transmit these types of information through e-faxing systems without lag time. No more busy phone lines. Instead of having to spend the time to figure out if your fax has even been sent and received, e-fax minimizes all of that worry. 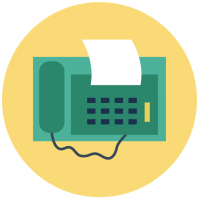 No more waiting for the receiver to call you to confirm they have received your fax. Which brings up another concern -- if your organization only has one traditional fax machine with several people receiving and sending faxes, how are you actually keeping track of what comes and goes? After you use e-faxing solutions for one month you will see how much time is saved to allocate to other, more pertinent activities in your organization. Did you know that as a healthcare provider you will be able to e-prescribe by e-faxing prescriptions? Are you hearing from your office managers and admins that they need better systems to manage their staff as well? Everything is moving online, and organizations ahead of the curve will be on pace to increase productivity company-wide.